Most everyone has heard the old story about how Nags Head got its name. How, as legend has it, the early inhabitants of the sandy banks were not above tying lanterns around horses' necks (or their tails, one variation goes) and leading the animals up and down the beach. Merchant skippers at sea, seeing the bobbing lights, would take them for the anchor lights of ships safely in harbor and would steer for them. When they ran aground, the Bankers salvaged the cargo to supplement their own meager belongings. It seems more likely, all things considered, that this narrow section of the beach east of Roanoke Island was named by early settlers after geographically similar features of the English coast. But it is certain that some strange things used to take place off Nags Head. The story of Theodosia Burr Alston confirms that. Twenty-nine years old, daughter of adventurer, duellist and former vice president Aaron Burr, all trace of her was lost when her New York-bound ship, the Patriot, disappeared at sea in late 1812. Later in the century, deathbed confessions were reported of former pirates who said they had seized the ship and murdered all hands, setting the empty vessel to drift. In 1869 a portrait bearing a startling resemblance to Theodosia was turned up in a Nags Head cottage. 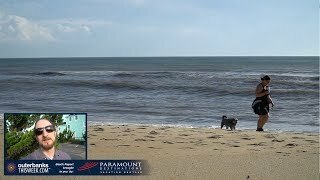 Its owner, an old woman, said that it had been taken from a deserted schooner that had come ashore in early 1813. . . .
Nags Head first became a resort in the early 1800s, when wealthy planters began the practice of taking off for the Banks during summer months to escape the unhealthy climate farther inland. The first hotel was built in 1838 and did a good business; excess visitors were quartered in private residences. Summer cottages began appearing about this time, most of them near the sound rather than the seaside. Dancing, fishing, bowling and sea-bathing occupied the visitors' time, while native Bankers kept to themselves in their own soundside village in Nags Head Woods. In 1851 the hotel was enlarged, and half a mile of mule-drawn railway was laid to make the journey to the sea less wearisome. In 1862 the Nags Head Hotel was burned by retreating Confederates. Rebuilt in the late 1870s, it boomed anew as the popularity of the resort grew and transportation to it became more convenient. One of the worst disasters in Banks history happened at Nags Head in 1877 when the 541-ton barkentine-rigged screw steamer USS Huron went aground in a November storm. The then-new Nags Head Life-Saving Station Number Seven was only 2 miles away, but Congress had been cutting costs and it was unmanned. Local fisher men helped the men who made it ashore, but almost a hundred sailors were drowned or crushed as the fearful surf tore the iron ship to pieces. Today the Huron lies straight out between mile markers 11 and 12, even with the end of Nags Head Pier. Nags Head was incorporated as a town in 1961, and development has been the name of the game since then, though it’s worth noting that the Town leaders has been successfully mindful of leaving open space and creating parks and performance spaces that benefit locals and visitors alike. A center of recreation (fishing, swimming, boating, standup paddleboarding, surfing), art (the largest collection of studios and galleries on the Banks) and legend, Nags Head still holds to its old title as the premier resort spot of the North Carolina Coast.